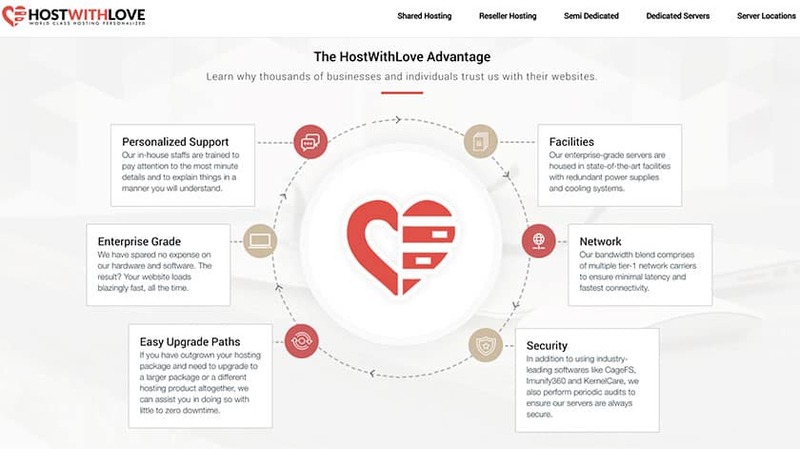 HostWithLove Review 2019: Is HostWithLove a Good Hosting? HostWithLove provides fully managed web hosting and dedicated servers to 6,000+ customers in the U.S., the U.K., Europe, Brazil, and Asia. The company has secure and well-equipped data servers in nine locations across four continents. Established in 2012, Singapore-based HostWithLove is an IT company that offers fully managed web hosting services to customers who want to rev up the performance of their websites. With data centers in nine locations, they serve more than 6,000 customers and power thousands of websites around the world. HostWithLove operates enterprise-grade servers with fast SSD disks in modern facilities with redundant power supplies and networks (including multiple tier-networks that minimize latency and ensure fast speeds). There is no question about the performance or stability of HostWithLove’s servers. Optimizing resources and keeping servers secure and accessible is a delicate balancing act, which HostWithLove performs using the CloudLinux OS. Because they secure websites and data, no malfunctioning scripts or abusive users can bring down your website. Nevertheless, customers also enjoy daily onsite and offsite data backups via R1Soft with a 30-day recovery period. While unfamiliar control panels can be frustrating, HostWithLove’s control panels are easy-to-use yet packed with features. Within minutes of signing up, you can set up your personal blog, e-store or SSL-secured business website using any of the open source scripts, and connect it with MariaDB databases. You can also create personalized email accounts with SpamExperts filtering. HostWithLove leverages LiteSpeed Enterprise Web Server which is nine times faster than Apache Web Server. All their servers use Hardware RAID 10 to improve speed and redundancy, so you enjoy more processing power and can run scripts faster even with shared hosting. HostWithLove’s introductory packages are tailored for the everyday hosting needs. If you need more bandwidth and storage options, you can easily upgrade your shared hosting or switch to their VPS hosting or dedicated servers. Both are great for businesses that have traffic-heavy apps and websites, or anyone who wants to run custom applications. Web design agencies (and similar) might consider their reseller hosting packages that come with individual WHM/cPanel accounts. HostWithLove has different packages at different price points, and their affordable hosting packages are easy to scale up. In terms of commitment, you might start with a monthly plan, then move to a better value yearly plan when you become more confident. HostWithLove has a friendly and efficient technical support team that’s known for giving well-thought-out responses and satisfactory solutions. They’re not an outsourced outfit, they work in-house from their offices in Singapore, and they should get back to you within an hour when you reach out to them via their online ticketing system or Facebook. If you’re looking for a Singapore-based hosting company that offers managed hosting services and stellar customer support at a fair price, HostWithLove should be at the top of your list. The huge number of websites and clients under their umbrella is a testament of their services. Wondering how HostWithLove stacks up against other Web Hosting companies? Enter any other Web Hosting company and we will give you a side-by-side comparison.